According to an announcement posted to Apple's Developer portal, TestFlight is now compatible with apps built for the iOS 10, watchOS 3 and tvOS 10 betas released on Monday. The release supports a number of newly introduced features like SiriKit and push notifications for tvOS, among many others. In accompanying release notes Apple reminded developers that all beta apps in iOS 10 include a 3D Touch Quick Action that grants testers home screen access to the app feedback system, a much simpler process than digging around for an in-app feedback form. Overall stability has been improved, though Apple notes beta apps installed through TestFlight might be inadvertently replaced by shipping App Store versions if the automatic app update feature is turned on. A fix will be included in a subsequent release. As for iTunes Connect, Apple added a new analytics tool for measuring App Store impressions. Developers can now see how many times their app icon has been viewed on App Store search results, the Featured page, Top Charts lists and its own product page. The tool is capable of calculating conversion rates from anywhere on the App Store. Apple also published a document on App Store search optimization to help developers better target consumers. Apple notes iMessage App submissions are not yet supported by iTunes Connect. 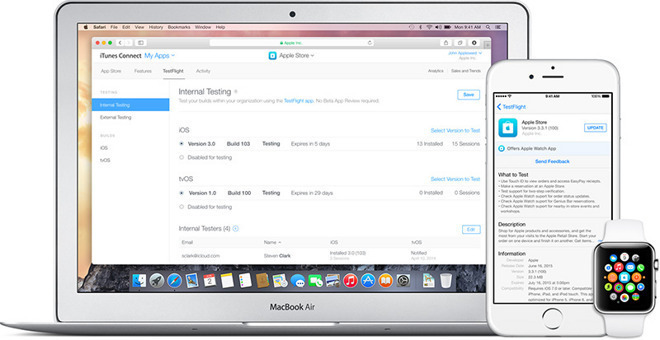 Developers and testers can download TestFlight for free from the App Store.